It's the best day of the week ... Fri-YAY!!! So excited for the weekend this week, maybe more than normal. I absolutely love a weekend of possibilities!! Plus ... 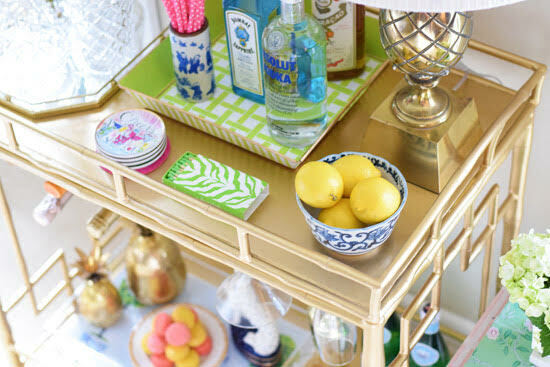 I am super excited about today's bar cart. 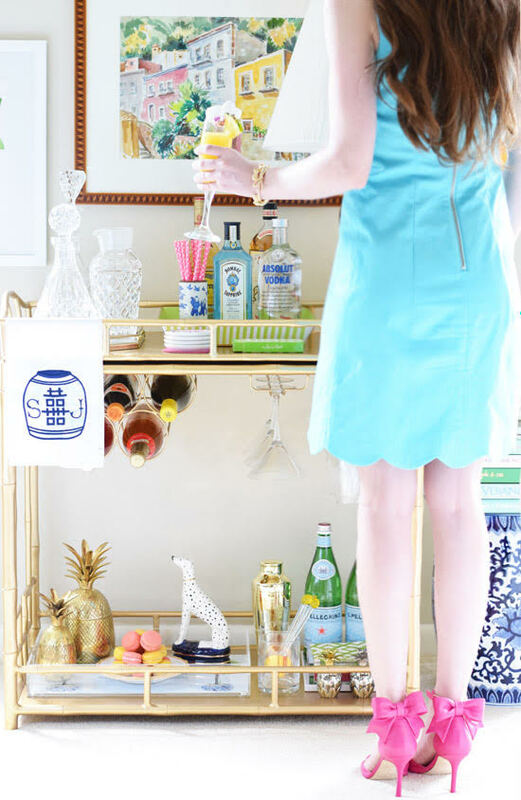 Summer from Girls in Madras is sharing her bar cart with us today and I just adore Summer! I connected with her immediately after we met, we have so many things in common. 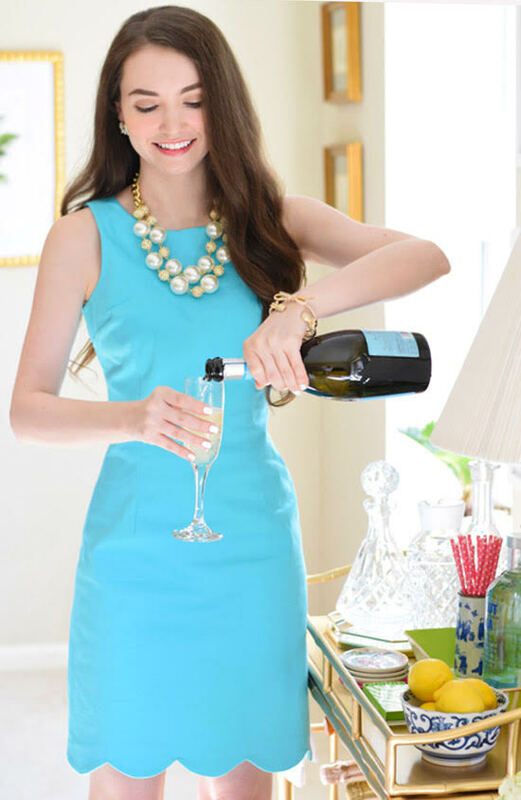 I just adore her classic preppy style and her home is so similar to mine in the way she mixes old and new. And I mean ... she is just as cute as a button. 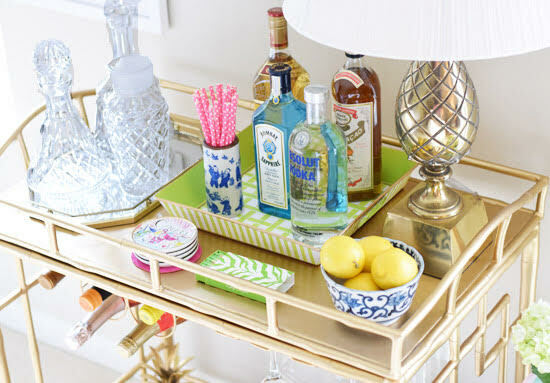 In my humble opinion Summer sets a perfect bar cart! 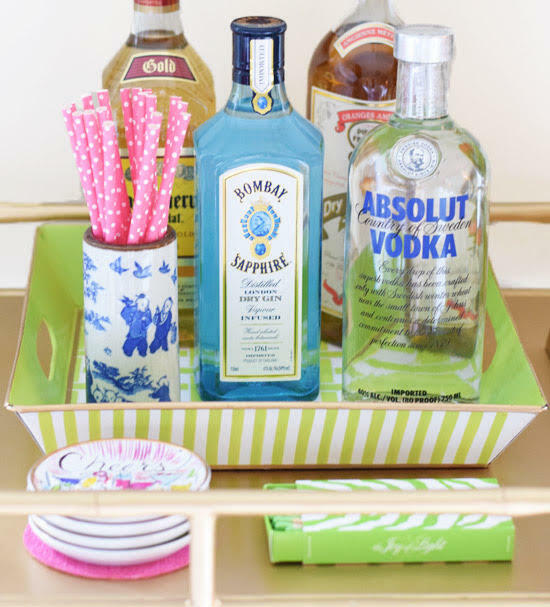 Flowers, fun decorative pieces added in and all of her favorite drinks ready to create a drink for her besties. As I look at her cart I can spy five things I own ... including the darling dalmation. I told you ... we have very similar styles. And the monogrammed hand towel ... yep, have one of those too! First of all, tell me about Summer and Girls in Madras. How did the journey to the blog begin? Well, I suppose we could start with my name! A lot of people are surprised when I tell them that Summer is actually my grandmother’s maiden name. My family tends to use last names as first names, so I feel lucky I ended up with a name that’s consistent with my personality and style. I’m the first in my family to be born outside of the eastern seaboard. As much as I love the Midwest, I’m a Virginian at heart. Before the blog, I worked as a contributing writer for two local magazines, specializing in culture, art, and style. I’ve always had a special fondness for classic coastal styles, from Nantucket to Palm Beach. 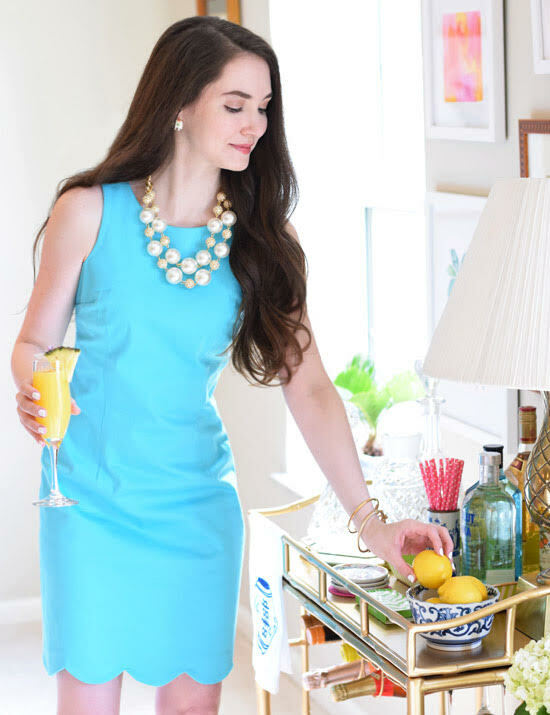 My fashion editorial experience was a big nudge toward blogging, but my passion for interiors, which I rediscovered while decorating my first “big girl” apartment, was the final nudge. Finding inspiration in the most unlikely places. Fun fact: The idea to name my blog Girls in Madras came to me while I was standing in line at my go-to lunch spot. A woman called out to me from across the room, “Hey girl in madras! Where’d you get your skirt?” I couldn’t get “girl in madras” out of my head all day, so I just went for it! I love that you are old school prep (me too!) ... what is your favorite thing about your style? 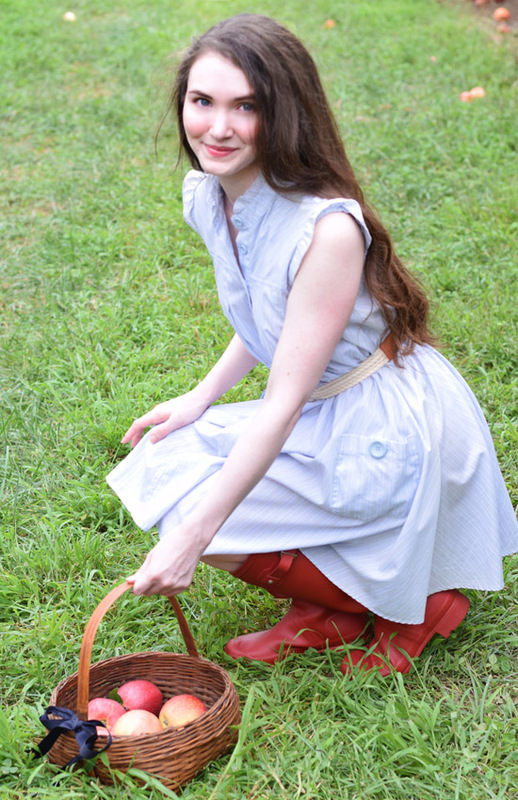 I think my favorite thing about having a classic style is that when I look at old photos of myself, I think Wow! I forgot I had that! a lot more than Eek! Wish I’d never worn that in public. I like to think of my style as a potential source of inspiration for future generations of my family. Johnathan Adler says “if your heirs won’t fight over it, we won’t make it,” which, to me, completely encapsulates the preppy ethos. I also love finding new and inventive ways to style timeless pieces, whether it’s a planting a set of old canes next to a modern console or spicing up a classic trench with bright accessories. Ah, I love this! 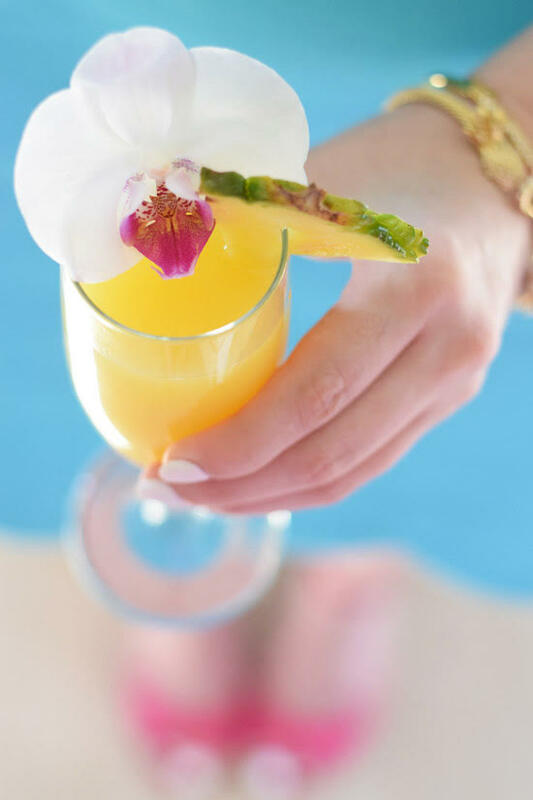 My perfect day would begin with a brunch of crepes and mimosas with my besties. From there, I’d head to the art museum and wander semi-aimlessly through the artworks, getting lost in the shapes, colors, textures, and stories. Then, I’d spend the rest of the day at the flea, hunting for watercolors and blue and white. 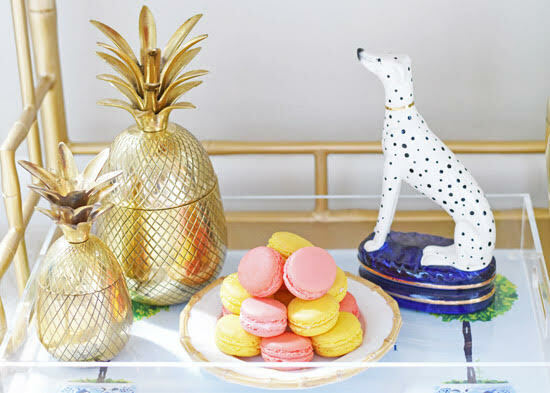 I’d have a gather a few friends for “flamingle” party and stock my bar cart with flamingo party favors, cookies, and décor. It’s been on my entertaining bucket list for some time now! 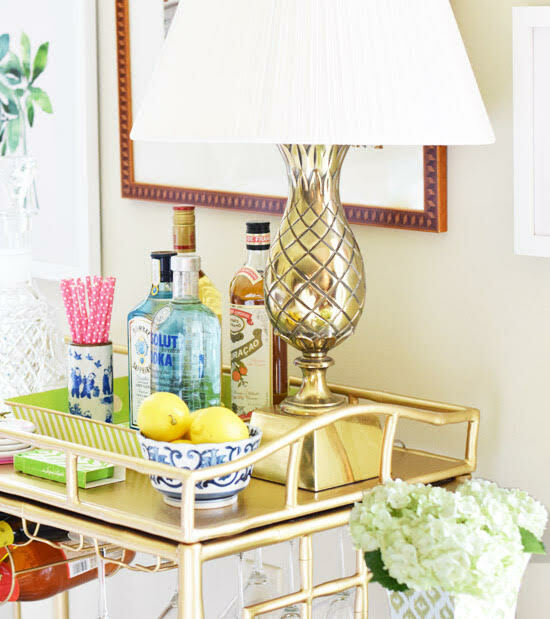 I love that your home is a mix of things you have inherited and newer pieces? What are your two favorite things that have been handed down to you? Thank you! And yes, it’s truly a hodgepodge of eras in here! I love a house that evokes a sense of personal history and family history. 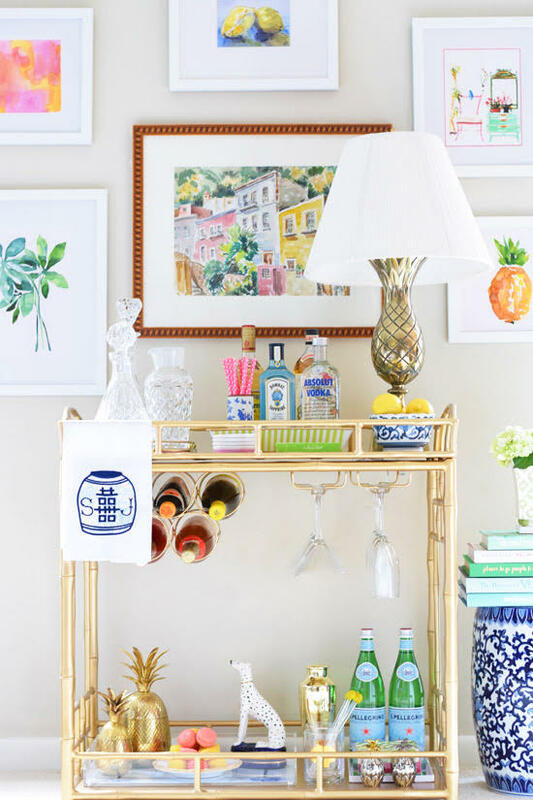 The one piece I have that really ties the generations together is my grandmother’s pagoda-topped china cabinet, which is what sparked my obsession with all things chinoiserie. I keep a few heirlooms on display in there, as well some newer pieces. Another item I adore is my grandmother’s Persian rug, which contrasts nicely with my modern lacquered console. Tell me about your vintage art collection. It started with a 1940s vintage watercolor of Mexican houses that I bought at a San Francisco flea. I was drawn to the colors and the inlaid wood frame—I knew I’d find the perfect place for it one day. 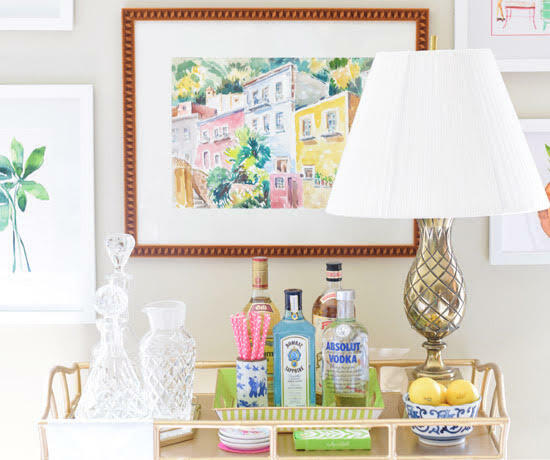 It’s now the centerpiece of my bar cart watercolor gallery, surrounded by a mix of originals and prints. And my latest addition to my vintage painting family is an impressionistic Bermuda sailing scene by mid century artist Alfred Birdsey! I get a lot of inspiration from museums, flea markets, photography books, and my travels. I’d probably be standing in line at the farmer’s market, wearing a cotton sundress, sandals, and carrying a straw tote. Well, nothing beats a glass of wine, a cheese plate, and a Gilmore Girls marathon! A potted palm tree, a good pair of leather riding boots, a nice set of monogrammed napkins, a cashmere travel wrap, and ginger jars. Isn't she just fabulous? 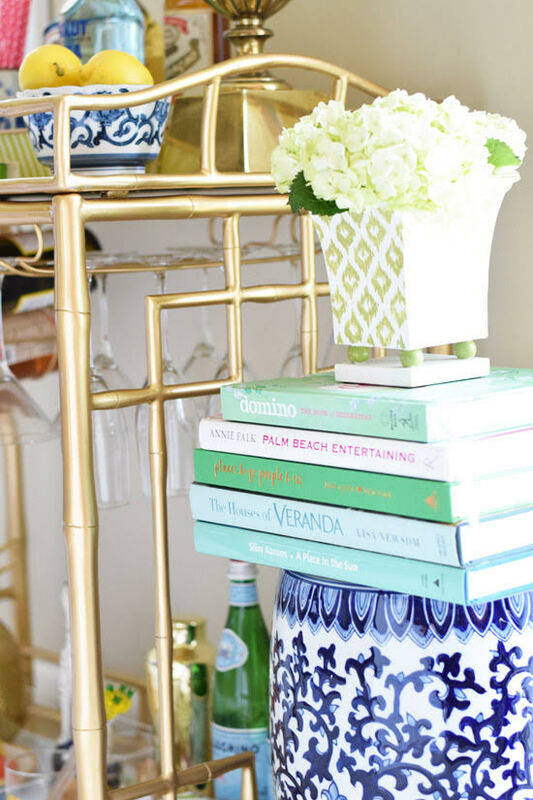 I truly love her style and how she decorates her space. She and I share a very similar thought when styling our home. I truly believe our home is special to us because of so many of the pieces we have inherited from our families. I look around and see so many things that mean so much to me because either my family gave it to us or his family gifted it to me. I love using the Hubs grandmother's monogrammed silver mixed with plates I have found at an antique store and topping it off with fabulous new monogrammed napkins. For me it just makes it so much more. You will adore Summer as much as I do ... and no thank you necessary!! Follow her on Instagram and sign up to receive her blog. I just read this week's post and I can tell you I am a firm believer in everything she suggested, especially the last two weeks! Thank you precious girl for saying yes to this feature!! I know we will continue to grow our friendship and I can't wait to collaborate in the future! Happy Friday ... pop the champs an hour early! !